HONOLULU – If you drive a car, fly in a plane, use air-conditioning to cool your home, or engage in other activity powered by fossil fuels that emit greenhouse gas, you may soon have new ways to offset your emissions locally, by supporting Hawaiian forest restoration. On Friday, Jan. 27, 2017, the State Board of Land and Natural Resources (BLNR) approved Hawai‘i’s first ever carbon offset project in State forests. 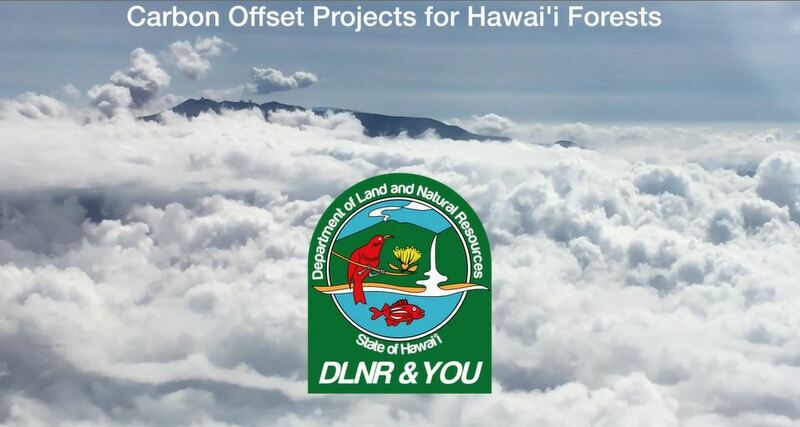 DLNR and its Division of Forestry and Wildlife (DOFAW) will now issue a request for proposals for private entities to create a carbon forestry project in the Pu’u Mali Restoration Area in the Mauna Kea Forest Reserve on Hawai‘i island. DLNR is also in the process of creating a carbon offset pilot project on southern Maui, where carbon credits will be sold directly by the State to buyers. The Kahikinui State Forest Reserve (SFR) and the adjacent Nākula Natural Area Reserve (NAR), high on the south slopes of Maui’s Haleakala, are steep, generally dry, and windswept. Over the course of many decades, uncontrolled grazing by introduced invasive hooved animals, like goats and cattle, virtually destroyed the native koa and ʻōhiʻa forest in this area. This has caused serious erosion, loss of native habitat for endangered plants and animals, increased wildfire threats, and reduced watershed function. DOFAW Administrator David Smith explained, “Ultimately this will give individuals, organizations, and companies the opportunity to purchase credits directly from the State to offset their greenhouse gas emissions, which cause global warming. Trees and forests store carbon, so the way we remove it from the atmosphere is by planting more trees.” The carbon offset pilot project is proposed for funding from the Hawai‘i State Legislature. The Leeward Haleakala Watershed Restoration Partnership, a voluntary watershed protection alliance of 11 public and private landowners encompassing 43,000 contiguous acres, has led forest restoration at Kahikinui and Nākula to date. Over the last three years DOFAW and its partners have constructed more than 7 miles of ungulate proof fencing, removed 700 invasive animals, and planted 45,500 native plant seedlings in the Kahikinui SFR and 71,000 trees in the Nākula NAR.